See below for pricing and additional information. Grammar Textbooks are smyth sewn, reinforced hardcover books for repeated classroom use. Grammar and Writing 3 also offers two consumable options to significantly reduce student copywork. Each textbook presents a complete course of over 100 Lessons and Review Sets. Writing Workbooks are perfect-bound (softcover), perforated, and three-hole punched for individual use. Each workbook contains 20-40 consumable writing lessons to complement the Grammar Textbook throughout the school year as directed by the teaching schedule. Each component in the Grammar and Writing series for schools is printed in the USA. 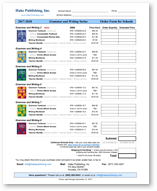 We accept school orders by mail, fax, or email. For your convenience, you may open and print this Grammar Books Order Form (PDF).